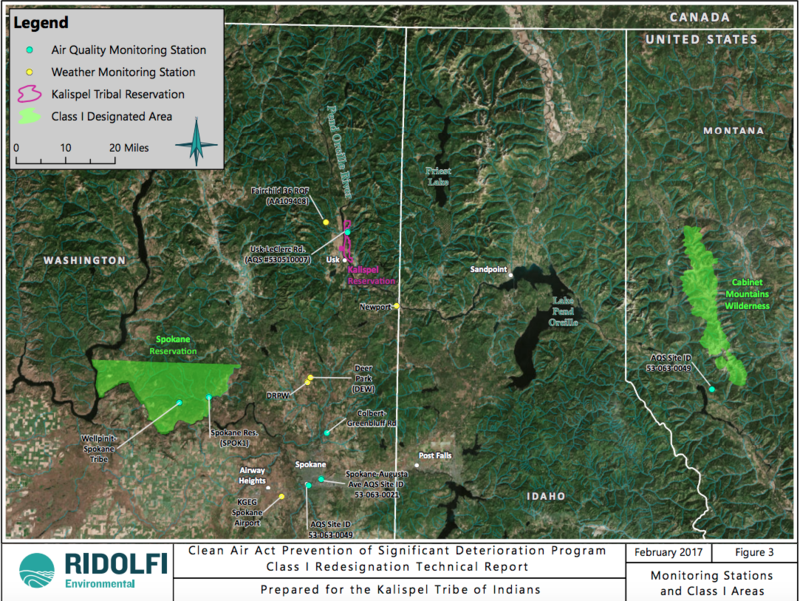 A map prepared by Ridolfi Environmental for the Kalispel Tribe of Indians' redesignation to Class I air over the reservation shows where air monitoring and other Class I space already exists. It looks likely the Environmental Protection Agency will approve the Kalispel Tribe of Indians' proposal to have more restrictive air protections over its reservation in Northeast Washington. The process of switching to a Class I designation under the Clean Air Act has taken about a year-and-a-half and will align the standards over the roughly 4,700-acre designated reservation with those for many wilderness areas and national parks around the country. The move was started after the tribe learned that HiTest Sand out of Alberta was proposing to build a silicon smelter nearby. At the time that Gov. Jay Inslee and the company announced the "project of statewide significance" in August 2016, it was announced it would be built in Usk, just across the Pend Oreille River from the tribe's designated reservation. Many at the tribe felt blindsided, says Deane Osterman, executive director of the Kalispel Natural Resources Department. "Well, we were taken aback," Osterman says. "It really created a real threat to the tribe. In the 25-plus years I’ve worked for the tribe, we have never once considered our air resources at risk. We have really good quality." So his department started researching the current air quality and moving to protect it. The work to redesignate the air space from Class II to Class I started in early 2017. After that, it was announced the silicon smelter site had moved, and it is currently proposed for a site south of Newport on the Idaho border. HiTest has created a new company, PacWest, for the new project. While the air designation protects the air space right over the reservation from significant degradation from pollution, it doesn't mean that no new industry or polluting businesses could go in the surrounding area, Osterman explains. In fact, in the process of working toward the redesignation, scientific study showed that multiple gas power generating plants could be built and still not pollute the currently pristine air enough to cross the Class 1 thresholds, he says. "What we found in our air shed, and this only applies on that area above the reservation, is that you could build five fairly large combined cycle turbines in Deer Park and our Class I air shed wouldn't affect it," Osterman says. "So it’ll have an impact on PacWest, but maybe not as dramatically as if they were across the river." The move to change the air classification has drawn criticism from Bonner County officials and others who worry about potential impacts to new industry and jobs in the area. Osterman notes that while some neighbors were concerned the redesignation might even impact people using wood stoves, that isn't the case. "There’s been a lot of concern before people fully understood what this was all about," he says. "They thought it’d severely impact people’s ability to use wood stoves or drive. This doesn't relate to any of that." While it may not even have large impacts on PacWest at its new location, the stricter designation may require the silicon smelter look at other options for the height of its stack, the scrubbers used to reduce pollutants or other measures, Osterman says. "To go to Class I," says Osterman, "it might marginally impact PacWest’s development." That is, if other concerns from the tribe and Pend Oreille County residents don't get in the way of the project first. Currently, the Department of Ecology is working on developing the environmental study that will determine which mitigation measures or changes may be necessary to reduce negative effects from the project. But even if permitting is all completed, that doesn't mean the project won't create adverse effects, Osterman notes. "One of the things we’ve been concerned about is many of the political leadership and general citizenship think if it passes permitting, somehow it's OK," Osterman says. "All it’s done is made the pollution lawful, not unharmful." In the meantime, for the clean air redesignation, EPA is taking comment through Dec. 14. More information and a technical report can be found on the tribe's website. The change to Class I could take effect in early 2019.